The cover photo of Equal Justice Under Law, Constance Baker Motley’s 1998 autobiography, captures Motley, James Meredith, and Medgar Evers exiting a federal courthouse in New Orleans. It was 1962 and Motley, a staff attorney for the Legal Defense Fund of the National Association for the Advancement of Colored People (NAACP), was there to argue on behalf of Meredith’s right to attend the University of Mississippi. The school had denied him that right because he was an African American. To a very real extent, the three figures capture the unified forces of the freedom struggle. Evers was a leading figure in the protests then sweeping the South; Meredith had no background as an activist but was a black man moved to challenge institutional racism; and Motley was a lawyer who fortified Meredith’s efforts and Evers’s organizing with brilliant work in the courtroom. Beginning in the 1950s and for many years thereafter, Constance Baker Motley deeply immersed herself in the black freedom struggle. She was born Constance Baker in New Haven in 1921 to parents who were natives of the Caribbean island nation of Nevis. She attended the integrated New Haven public schools before going to college at historically black Fisk University in Nashville and then transferring to New York University. She was the first black woman to attend the Columbia University School of Law and received her law degree there in 1946. Later that year she went to work at the NAACP Legal Defense Fund, where she remained for twenty years. There she worked with and befriended Reverend Martin Luther King Jr. and many other leading figures of the civil rights movement. In 1954, she wrote the first legal brief in the groundbreaking Brown v. the Board of Education case. Three years later, Motley won an equally significant case in Little Rock, Arkansas, after protesters spat on nine black teenagers and physically prevented them from attending what had been an all-white school. Then, in 1962, Motley represented dozens of young people (known ever since as the Freedom Riders) who integrated public transportation by defying violent protests to ride buses deep into the former Confederacy. She won nine of the ten cases she argued before the Supreme Court, and as she did for James Meredith at the University of Mississippi, Motley successfully represented plaintiffs who became the first blacks to attend numerous other Southern colleges. In 1964, Motley entered the political arena. She became the first black woman ever elected to the New York State Senate and, a year later, the first woman of color elected as Manhattan borough president. When President Lyndon Johnson appointed her a federal judge in 1966, she also became the first black woman ever to hold that post. Though her professional life took her far and wide, Baker Motley always maintained her Connecticut roots. She and her husband Joel Motley Jr. married in New Haven and owned a home in Chester for many years. When she died in 2005, Motley’s family held her funeral in the same New Haven church where she married. Constance Baker Motley’s efforts in combating racial discrimination lent itself to memorialization in variety of different forms. Among those with the greatest impact were several documentaries. Connecticut Public Television (CPTV) honored Motley’s life and work with “Justice is a Black Woman: The Life and Work of Constance Baker Motley,” a special that aired in 2012. Also, in 2015, a documentary by R. E. Rogers entitled, The Trials of Constance Baker Motley, premiered at the Tribeca Film Festival and lauded many of her professional achievements that still shape our lives today. 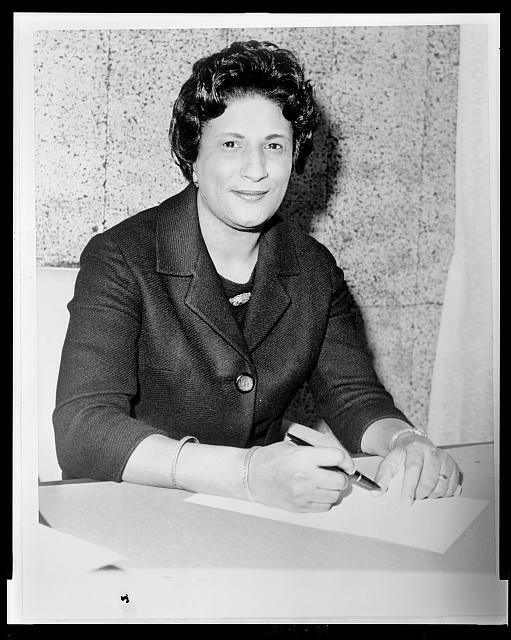 “Constance Baker Motley.” Connecticut Women’s Hall of Fame, 2015. Link. 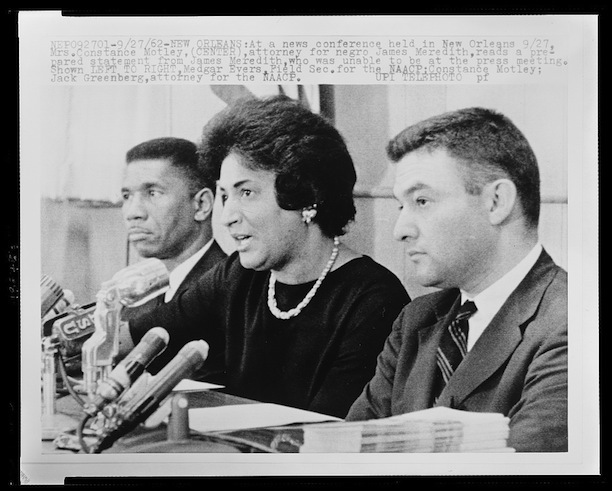 Justice Is a Black Woman: The Life and Work of Constance Baker Motley. Hamden, CT: Quinnipiac University, 2012. Rodgers, R.E. The Trials of Constance Baker Motley, 2015. “Constance Baker Motley House.” Connecticut Freedom Trail, 2017. Link. “Finding Aid to the Constance Baker Motley Papers, 1948-1988: MS 110.” Smith College, Sophia Smith Collection, 2015. Link. Motley, Constance Baker. Equal Justice Under Law: An Autobiography. New York, NY: Farrar, Straus, and Giroux, 1998. Motley, Constance Baker, James K. Feibleman, and Telford Taylor. Perspectives on Justice. Evanston, IL: Northwestern University Press, 1975. Motley, Constance Baker. The Legal Aspects of the Amistad Case. New Haven, CT: New Haven Colony Historical Society, 1990.